Riding with Children | Home of the Crofton Bike Doctor Blog! The summer is here and now is a great time to ride with your children. In the past parents had to be creative in how to bring their children along for the ride, how to ride longer with children or even how to teach them to ride. Today families have many options that are safe and to help get their children out outdoors, involved in cycling. With some overlap across them there are several phases of riding with children; bring them along phase, teach them to ride and ride longer with them. During the time you are riding with them they will reach the age where they want to learn how to ride. It is even easier to get your child riding on two wheels thanks to the balance bike. Children as young as eighteen months can start learning to ride with a balance bike. The idea of the balance bike is to allow children to learn how to balance and counter steer. 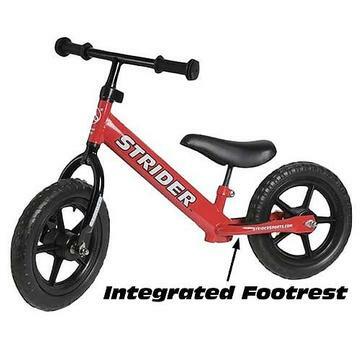 This allows most children to bypass training wheels and move right to riding a two wheeler. Balance bikes are available in models that fit children from eighteen months to ten years old. Once you have them riding on two wheels you may find that mom and dad want to ride longer then what the child has the energy for. To address this challenge there is the pedal trailer. A pedal trailer attaches to an adult bike and allows the child to pedal when they can. There are two styles of pedal trailers. The most popular is good for children starting at about 5 years of age depending on height etc. and have a sitting position just like a bicycle. This style is another great way to help children improve their balancing skills and allowing the adult to get a longer ride in. The second is a recumbent style that is geared for younger or smaller children less than 65 pounds. They sit in a seat and have a harness system that secures them, allowing them to pedal and enjoy the scenery. Pedal trailer offer more fun and fitness for everyone on the ride. With all the tools available it is easier than ever to get your child involved in cycling.